We are so excited at Visionary Veils to offer this new service to our clients. We are now able to offer a bespoke beading design service to our clients. 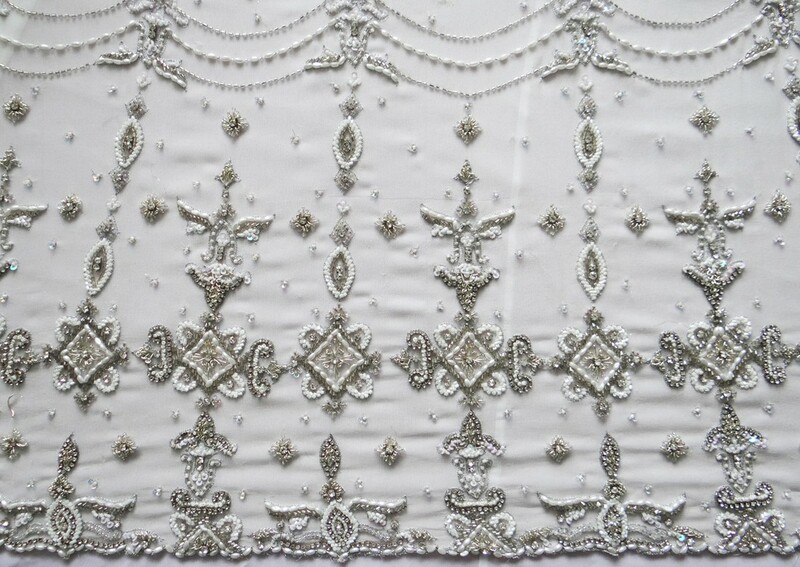 We receive so many beautiful photos of wedding dresses from clients and many of them feature ornate beadwork. We already have an extensive range of edgings available but now we can also offer a bespoke service to replicate the exact detail on your wedding dress. After we have discussed the design with our client we contact our design partners to get an estimate of the cost involved in the piece they would create. If our client decides to proceed with a commission then a sample of the work and photographs will be provided before work on the final piece is completed. Work in the progress photographs? What pieces can be created? There are many possibilities of pieces that can be created for your wedding ensemble. We have already commissioned pieces for clients including a beaded vintage cap, motif design and bridal belts. Order time – It is important to contact Visionary Veils in plenty of time if you are considering exploring this option.